Book published by Sunderland and Hartlepool Publishing in 1990, 94 pages. Large Rectangular Paperback - c.21cm by 29cm (S6961). From the introduction: The Wear gave birth to Sunderland. Along its banks the first dwellings were built and communities became established... and ships and shipbuilding became the dominant industry of the Wear for over 650 years. 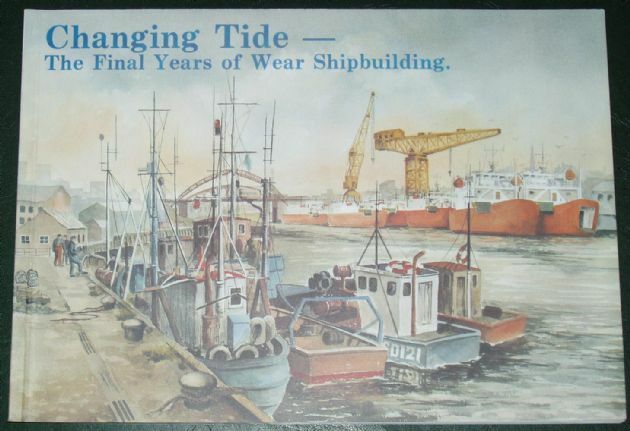 At the turn of the 20th century shipbuilding and related industries employed more than 20,000 people and around two fifths of Sunderland's entire male labour force. But in December 1988, when the workforce had been reduced over many years to less than 2,000 the shipyards finally closed.... the luftwaffe bombs did not destroy the industry on the Wear. It fell victim to a government's view of economics. Condition of the book is generally very good. The cover has one or two very minor scuffs, and some light nibbling along the edges, but the spine is tight and intact, and all pages are clean, intact, unblemished and tightly bound.